In Ezekiel 37:1-14 recounts one of the most important prophetic visions of the Bible. The vision takes Ezekiel to a “plain near a settlement of exiles at Tel Abib.” Ezekiel was prophesying at a time when the people of Israel were in exile. The Babylonian people had overcome the nation of Israel and scattered the people among their empire. This message here, is a message for exiles. They were literally exiles who had been removed from their homeland and placed in the lands of the occupying nation. We too are exiles of another kind. We are citizens of the Kingdom of God living as exiles in a land that is opposed to the values of our Kingdom/nation. So, this message is a message for the people of Israel and a message for us as well. This puts Ezekiel in a position to be used by God. God tells Ezekiel what to say and he tells the bones to get ready because God is going to make them come to life. Flesh, and muscle, skin, and breath will come into these bones and they will rise up again. First the bones must rattle and rise up and find their rightful place. The Hebrew language gives us a picture of all of the bones having to move great distances to find their rightful place. Can you imagine what this must have sounded like? Then sinews form, then muscle or flesh, and finally skin. I wonder if this too had a sound-track? I wonder if it sounded squishy, gooey, and slappy. 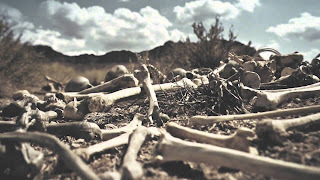 After all of this flesh, muscle, and skin formation, they are still just bodies lying on the plain as if they had been slain in a great battle. Think of this, all of the internal organs must be there, all of the biochemical processes that must go on in a living body are ready to go. But the hearts are not beating and there is still no life in these bones and bodies until God gives them life. They are still dead bodies. And so Ezekial prophesies again and calls upon the four winds to blow the breath of life into these still dead bodies. God’s breath comes into these bodies and they stand up and become a mighty army of God. The word wind here is an obvious reference to the Spirit of God, what we would call the Holy Spirit. God is communicating some very important things here. · First of all, it conveys the creative power of God. The same power that was at work at the creation of the universe is at work here. · Secondly, when we die, it does not matter if we are put in the ground in a coffin, burned to ashes, or scattered to the wind, God can put us all back together again. We can be disintegrated into molecules and God can put us back together at the final resurrection of the dead. He knows where all of our bones and molecules go. · Thirdly, the bodies can be all put back together and have all of their rightful chemistry restored, but they are still not animate. They are still not alive until God makes them alive. God is the author of life and there is something elusive about the nature of life. Scientists have studied life and understand something of how living things work. But life is something other and requires God’s creative animation and his breath. God tells Ezekiel that this is a vision about the people of Israel. They thought they as a people were lost and dead, like dry bones. They thought that all hope was gone for them as a people. But God has other plans for the people of Israel. Isn’t this just a bit like us today? We look at the Christian landscape across Canada and we lament. We are tempted to lose hope in our God. But God has other plans for his church. The bride of Christ will be brought to life again. Just as our bodies must be enlivened by this mysterious quality we call life. Our institutions, churches, and programs are lifeless bodies, maybe even dry bones, until the Spirit of God enlivens them. God has given us the Holy Spirit to make us alive and make the church alive. Acts 2 talks about God’s Holy Spirit enlivening people and giving them new life. Is that our experience? Are we today, sensing God’s Spirit poured out in us, his people? “God raised Jesus from the dead, and we are all witnesses of this. Now he is exalted to the place of highest honor in heaven, at God’s right hand. And the Father, as he had promised, gave him the Holy Spirit to pour out upon us, just as you see and hear today. Acts 2 reminds us of our constant need to repent and assess what we are doing with our lives. Nowhere does the Bible say to repent of the past once and for all. This is a continuous process. Ezekiel tells us that the things we build must be enlivened by his Spirit. So, it is in our own lives, in our own churches, in our own ministries, we must ensure that we ask for and leave room for the Holy Spirit to enliven things. Do we actually expect the Spirit to show up or do we simply build more structures or pour on more human effort? If we build programs and structures and don’t ask God to make them live, then we have truly created a “zombie church.” It would be a church that walks around and does things but is not truly alive. What a horrible, ugly result that would be. This truly requires us to rely upon the Holy Spirit in all that we do. Lauren Daigle, a contemporary gospel singer has a song in which she speaks of Jesus who is still rolling stones. Take a listen to the words and read them on the screen. Today, I pray that God who rolled away the stone from the grave of Jesus, might roll away the stone that keeps us from being open to his Spirit in our lives. Buttrick, George Arthur, ed. 1956. The Interpreter's Bible: Volume VI. Nashville: Abingdon Press. D'Costa, Krystal. 2011. "The American Fascination with Zombies." Scientific American, October 26. Duguid, Iain M. 1999. Ezekiel: The NIV Application Commentary. Grand Rapids: Zondervan. Greenberg, Moshe. 1997. Ezekial: A New Translation with Introduction and Commentary. Toronto: Doubleday.